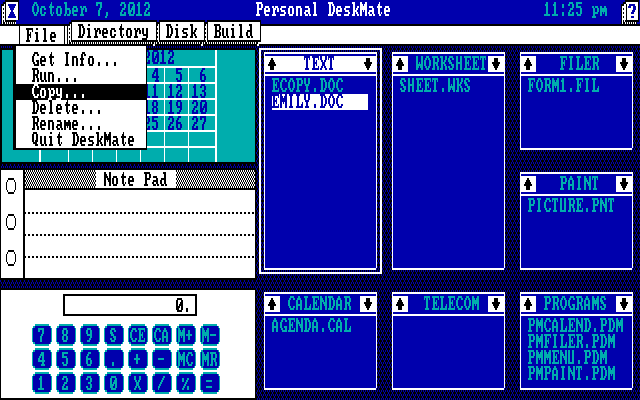 Tandy "Personal DeskMate" was the first graphical version of Tandy's DeskMate integrated office package. Previous versions were text mode based and did not use drop down menus. Released in 1986, Personal DeskMate is clearly influenced by the Macintosh, adding drop down "file" menus, desktop accessories, and dialogs. Personal DeskMate was designed for the Tandy 1000 EX, and runs in a 4 color 640*200 video mode that is only available on certain Tandy computers. "DeskMate"...................1985 (late) - special version written for the TRS-80 Model 4D. DeskMate II..................1986 (early) - Tandy 3000 - basically version I written for IBM keyboard. Personal DeskMate 2.....1987 (late) - Tandy 1000HX, 1000TX - added Music program. DeskMate 3.01..............1988 - Tandy 1000TL, TL2. Included Sound & Music programs. DeskMate 3.02..............1988 (late) - added "press enter to confirm exit" function for DOS version. 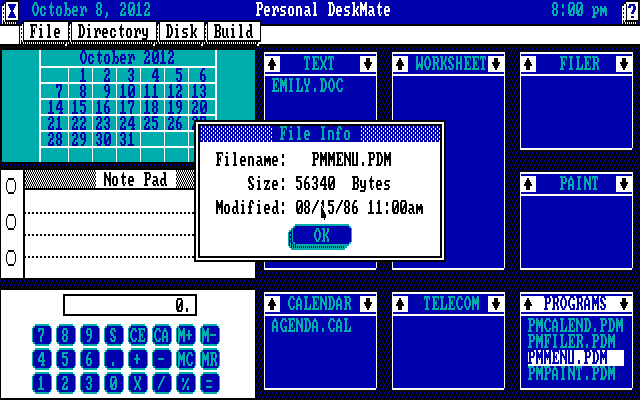 DeskMate 3.03..............1989 - Added PC Link, a precursor to AOL + other enhancements. 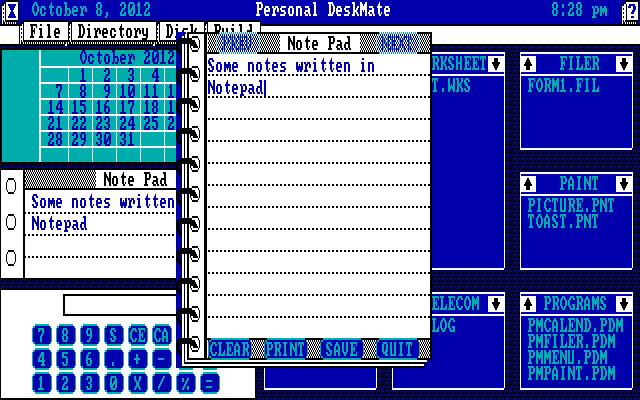 DeskMate 3.05..............1990 - Final PC version, added extended memory support. DeskMate 3.04..............1991 - Proprietary version for 1000RSX, 2500RSX - development began before v.3.05. This is the Tandy Personal DeskMate desktop. The desktop consists of tiled "Menus". A "Menu" can be either a file list box associated with an application or an accessory. You can navigate objects in Personal DeskMate with either the keyboard or a pointing device. To make use of DeskMate's pointing device, you must install an MS-DOS Microsoft Mouse compatible device driver. Unfortunately, most mouse drivers are not compatible with this Tandy graphics mode, at least in DOSBox. This version of DeskMate bundles an MS mouse compatible joystick driver (JOY.SYS), which seems to work if you have a joystick. The only other driver that seems to recognize this graphics mode is the Tandy Digi-Mouse driver, but that requires a proprietary bus interface card. Even the DOSBox emulator's built-in mouse driver gets it wrong and draws garbage where the cursor moves. Later versions of DeskMate do not appear to rely on the mouse driver to draw the cursor. Each file list displays files of the filetype for a specific deskmate application. You open documents from the list box, or use the list box menu itself to open a new blank document. This gives DeskMate sort of a crude file-desktop metaphor. All file management is performed directly from this desktop. There is no separate file manager. For example, to copy a file, choose the file from the list, select "File", then "Copy", and enter the name for the new file. The system menu contains a list of Macintosh-like accessories and control panel items. The accessories are the only programs that run in a window. All other programs use the full screen. Certain accessories appear on the desktop. However, despite appearances you can not use them directly on the desktop. What you see is on the desktop essentially a "preview". For example, clicking on the Calculator on the desktop or typing anything while it is selected, does absolutely nothing. 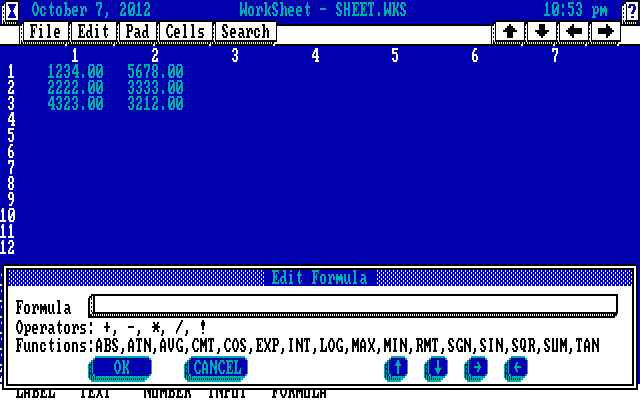 You must double click or press enter, which opens the Calculator accessory window. Personal DeskMate includes a several rudimentary office applications. This is the "Text" word processor. Documents may contain formatting instead of plain ASCII, but the only formatting options are bold and underlined. WorkSheet is a simple spreadsheet program. 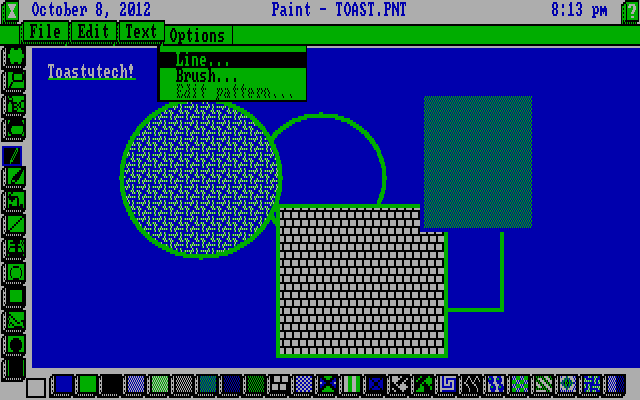 Paint is a graphical paint program... that uses all 4 glorious colors of the Tandy 1000! Oddly, it selects a different pallet of four colors than the other applications. Surprisingly it is possible to use Paint with only the keyboard.